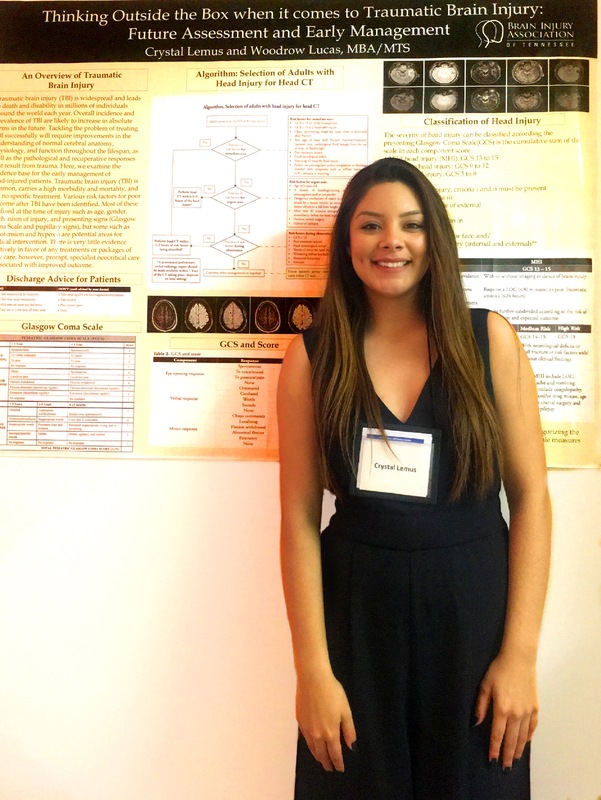 Fourth year honors neuroscience student Crystal Lemus recently presented her traumatic brain injury research at the American Neurological Association (ANA) Annual Conference in Atlanta, Georgia. At a time when support for basic and translational science is in need of a strong voice and the burden of neurological disease grows, the ANA serves as the champion of neurological research and the ally of all physicians and scientists who strive to make a difference through careers that combine discovery, education and clinical care. The ANA is a leading voice within the field of neuroscience and has counted the world’s leading academic neurologists as members. Lemus’s poster presentation was titled “Thinking Outside the Box when it comes to Traumatic Brain Injury: Future Assessment and Early Management.” Her research was conducted in conjunction with the Brain Injury Association of Middle Tennessee where she has served as a mental health curriculum developer and the official nonprofit blogger for the past three years. Traumatic brain injury (TBI) is widespread and leads to death and disability in millions of individuals around the world each year. Overall incidence and prevalence of TBI are likely to increase in absolute terms in the future. “Tackling the problem of treating TBI successfully requires improvements in the understanding of normal cerebral anatomy, physiology and function throughout the lifespan, as well as the pathological and recuperative responses that result from trauma,” Lemus said. For her research, she examined the evidence base for the early management of head‐injured patients and suggested that he-critical care with protocol-dried therapy is associated with significant improvement in outcome for all patients with severe head injury.